I can’t believe the Africa articles are over! Though I’ve been back in North America for over a month now I guess posting this really means it’s over. It’s a bit of a weird sensation. On one hand, a great adventure is over. On another hand, I have a lot to look forward to both in North America and when I get to Europe (hint: I have a big surprise for you in Amsterdam). Almost any time I fly back to North America I stop in New York. I do so because it’s cheaper, I can stop in at B&H and get some good camera gear, and it’s a quick trip up to visit my sister in Toronto. So, as usual on my way to Canada I stopped in the Big Apple. This time at B&H I picked up a 10-20mm Sigma lens (which I’ll be reviewing soon) which I have been dreaming about using for a while. I’ve been wanting to get wider for a while, and I think it’ll come in handy both in Canada and in Europe once I get there. For now, I used it on the beautiful Manhattan skyline. Seeing the Manhattan skyline from Brooklyn is one of my favourite photo spots in the world. It doesn’t even matter that there are usually about 50,000 other people there taking pictures, it’s just so beautiful. 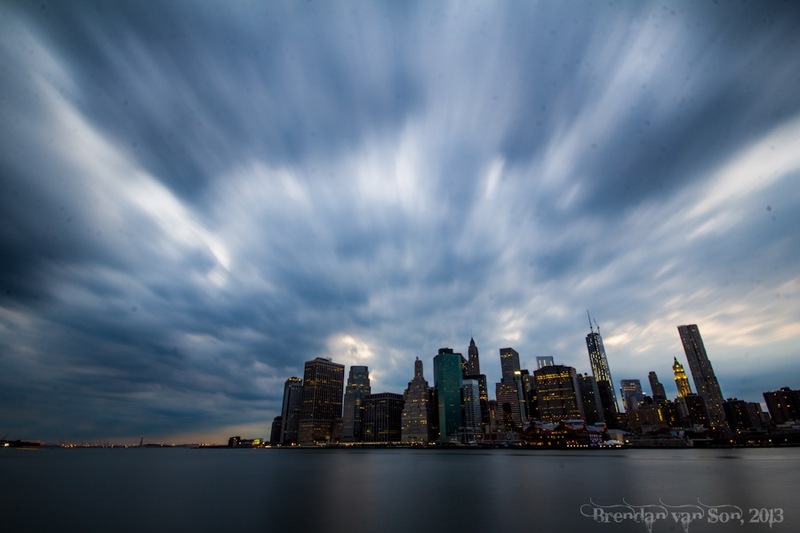 And while I’ve shot the Manhattan skyline from here before, I decided to do things differently this time, I shot super wide, and a very long exposure (more info below the photo). I love the effect that came with the image! When you shoot a really wide angle you get some serious distortion at the edge of the image, and well that can be a problem, with clouds you can use it to your advantage. In this photo, since some clouds are basically right over the camera, the long exposure gives them the appearance of moving. But the cool part of the wide angle is that in the center of the image, the clouds look still. Thus, you get some very dramatic lines that draw the eye directly to the subject, in this case Manhattan. The tech details of the photo are as such: 10mm, f/22, 30 seconds, 3-stop ND filter and a tripod. Cool photo of the city. The clouds make it seem almost like an optical illusion. I hope you got to do more than B&H and BK. But I love the combination of this photo more. Sky, buildings, sea, they are all perfect. Thanks Rebecca… 😀 ohhh the secret is brewing, and y’all will not be disappointed… all will be shocked!